Losing weight can be difficult but there are many tricks to keep you on track to losing weight and staying healthy. One area I think we all struggle with is portion sizes. In a world of bigger is always better, our view of a “normal” size portion for any given food is often very skewed. In the land of super size portions, what is normal? 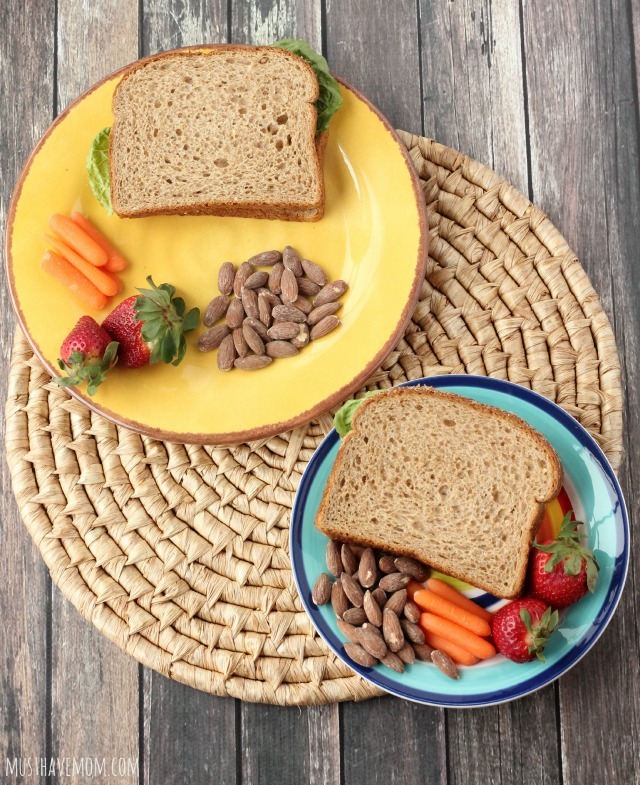 I’ve got some tips for easily portioning out serving sizes as well as some great Weight Watchers 1 Point Snack ideas for you. I’m a snacker by nature and I know that can be the pitfall for many people trying to lose weight. I’ll show you the snacks you don’t have to feel guilty eating and how to enjoy the proper portion sizes so you can stay on track to your weight loss goals. 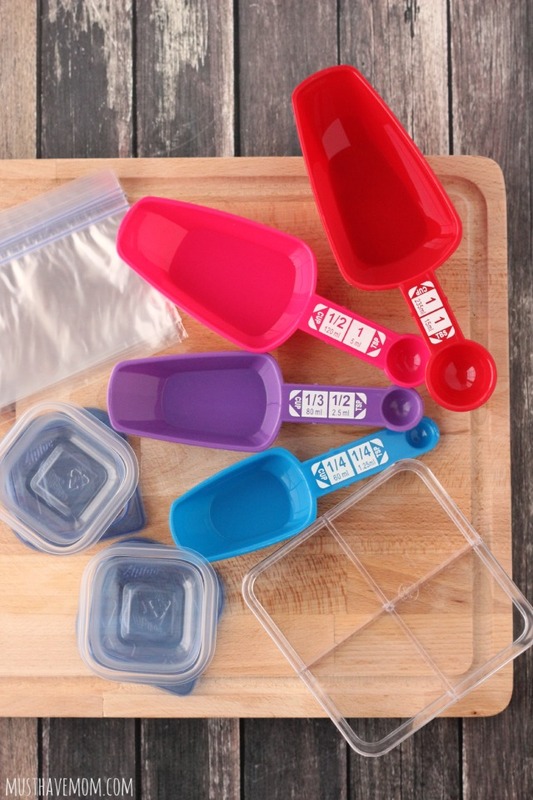 Having a few very inexpensive tools to help you portion your food is a huge help. I found these awesome measuring scoops at Walmart for a couple bucks. I LOVE them because the scoop side is in common serving size portions and the handle of it contains a measuring spoon side which works great for measuring out nut butters, oils and dressing. Often times I will have some ranch dressing with my salad and think that I can eyeball what 1 Tbsp looks like. It turns out my idea of 1 Tbsp and an actual tablespoon are very different! Always measure! Once you have an accurate idea of what a teaspoon or tablespoon of something looks like then you can go back to eyeballing if you must. I also love having the little reusable snack containers on hand. These are the smallest size, typically used for things like salad dressing. They are perfect for portioning out 1 point snacks. 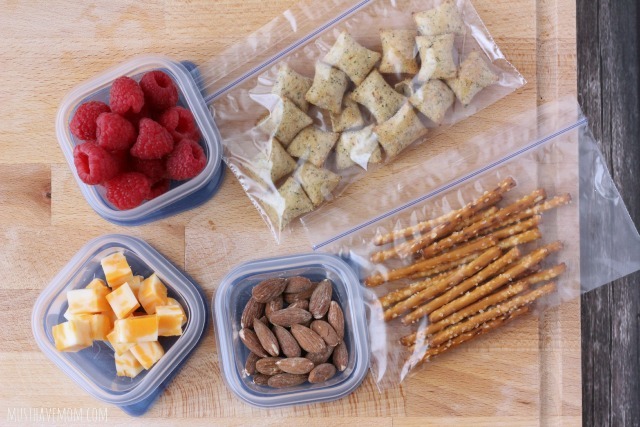 I also love the divided containers which allow me to portion out snacks ahead of time and have them at the ready, while keeping them separated. Finally, having the snack size zip top bags is a must. Measuring out your portions is a must. When you decide to have a snack just whip out a measuring scoop and measure it out and put it in a bowl or bag then put away the container so you aren’t tempted to grab more. 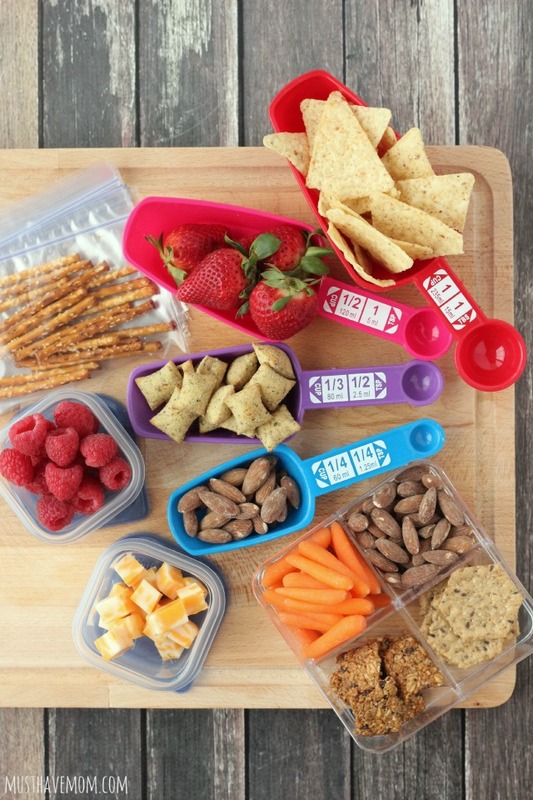 Portioning out snacks ahead of time is the perfect way to grab a healthy snack without the temptation of grabbing something more convenient. At the beginning of the day (or week) portion out single servings of each of these snacks so you can easily grab them later! These are all great ideas to get you started. I love the Weight Watchers app so I can easily see how many points a snack will cost me right from my phone. Just punch in any food and it will tell you the number of points that the food and portion size will add up to. I love choosing foods that keep me filled up. Almonds are a favorite that really keep me full for a long time. Cheese is a great mid-morning snack and paired with fruit it’s a great snack! I love that fruit and vegetables don’t cost me any points. 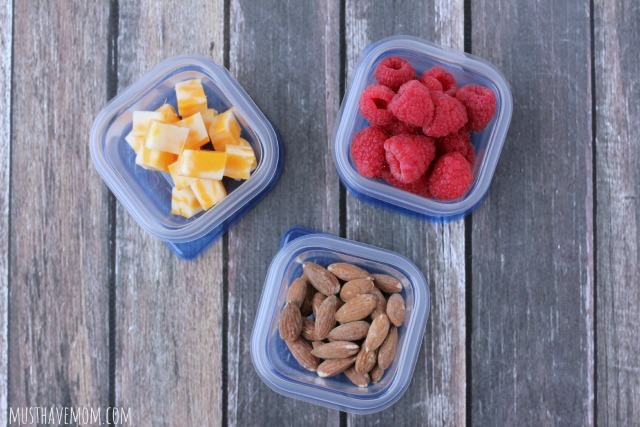 I can pair a serving of raspberries with my cheese or almonds to help fill me up and I don’t have to add any points to my daily total! Not only do I try to portion out snacks ahead of time, but I also use smaller packages. You can fool your eyes into thinking you are eating more than you actually are. Have you ever heard the phrase “My eyes were bigger than my stomach”? It’s true. Our eyes and our perception of how much food we are eating plays a big role in how full we feel and how much we pay attention to our hunger cues. 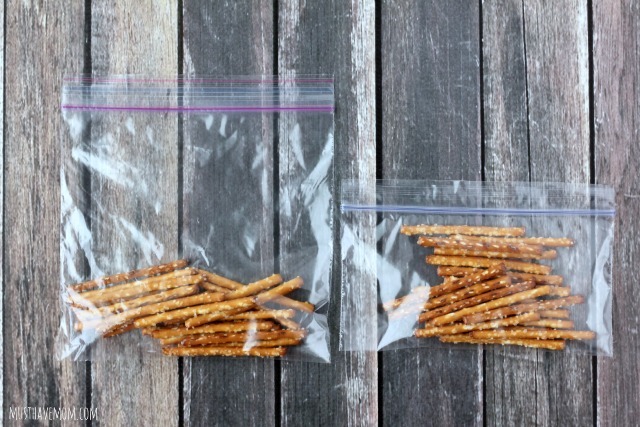 Instead of using the large sandwich bag for your single serving of pretzels use a snack size bag instead. Now your bag looks full instead of looking almost empty. It LOOKS like a bigger snack than it would if it was in a larger bag. Another way to have easy snacks on hand is to buy things that already have the points calculated for you. 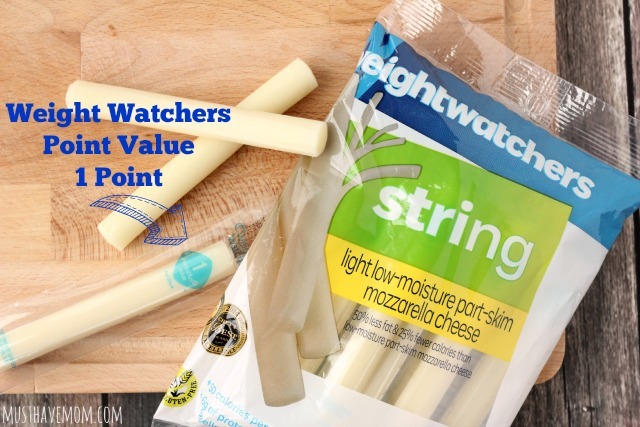 The Weight Watchers String cheese are 1 point each and say that right on the package! It makes it easy to keep track of your points. Which of these two plates would you pick? They both have the same amount of food but the smaller plate looks more full since there is less plate area to fill. By choosing smaller dinner plates you naturally take smaller portion sizes because you can’t fit as much on your plate. You also trick your eyes into thinking you have more food on your plate than you really do!